The fifth installment in TCM's ambitious documentary on the history of film, from the its first days through the turbulent 1960s, chronicles Hollywood in the 1940s. 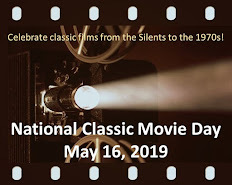 The opening scenes focus on landmark films such as The Grapes of Wrath, Citizen Kane, The Great Dictator, and Casablanca. Gore Vidal and others comment on the lasting influence of Orson Welles and Kane. They also offer fascinating stories behind the making of Welles' classic, to include the origin of "Rosebud" and a memo from William Randolph Hearst "encouraging" one of his newspapers to offer a kindly review of Buster Keaton's The Cameraman. 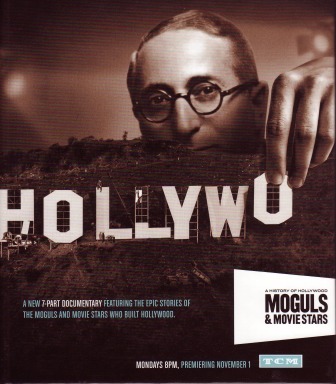 Much of the episode obviously keys on Hollywood's contributions during World War II, spanning from Frank Capra's Why We Fight series to films promoting Americana (e.g. the Andy Hardy series) to the USO shows with Bob Hope and the Hollywood Canteen for servicemen. This segment ends appropriately with the Sam Goldwyn's post-war Best Picture The Best Years of Our Lives. My favorite part of Warriors and Peacemakers is a segment that traces the rise of agents, a side of the film industry often ignored in documentaries and reference books. 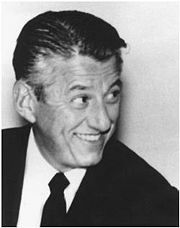 Yet, there can be no doubt that the influence of Lew Wasserman, the first "super agent" and MCA, had a significant impact on the studios. The increasing power of agents, along with the "de Havilland decision" and the breakup of studio-owned theatre chains (both also addressed here), led to the eventual collapse of the "studio system." Due to the constraints of its one-hour running time, the episode only touches briefly on the emergence of films with strong female characters, the treatment of minorities in the 1940s (e.g., Home of the Brave), the McCarthy hearings, and the birth of film noir. The latter is especially disappointing given the later influence of noir classics such as Laura and Out of Past. A more serious omission is the migration of great foreign filmmakers from war-torn Europe to Hollywood. Fritz Lang made classic 1940s fare such as Scarlet Street, while Jean Renoir (The Southerner), Julien Duvivier (Flesh and Fantasy) and other foreign filmmakers made memorable Hollywood contributions. Such criticism is minor, given the goal of covering a historically-packed decade in sixty minutes. Viewers unfamiliar with Hollywood in the 1940s will gain some valuable insight from Warriors and Peacemakers. More serious film buffs will enjoy the film clips, newsreel footage, and commentary on many of their favorite movies. YouCast Corporation provided a screening copy of this episode to the Classic Film & TV Cafe. Rick, I've been following this series and the episode you described is one in which I am particularly interested. The films of the war years are some of my favorites, and I'm interested to see what they have to say. All of the episodes have been fascinating material, teaching even an old movie buff like me lots of things I didn't know. Like you, I am surprised that there were such omissions in this one. I'm especially surprised the McCarthy mess isn't touched upon. I'm hoping that issue and film noir will be given important treatment in an episode about the 50's. Good review, Rick, and I am looking forward to Monday night! 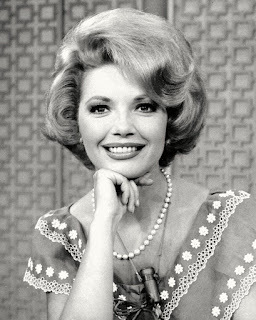 Becky, the McCarthy hearings are addressed in some detail. There just isn't enough time to give that important topic the in-depth coverage it requires. That's one of the challenges with providing an overview spanning several decades. Rick, I see that I read the part about McCarthy wrong -- you did say it touched on it. You're right that it's extremely difficult to get everything in. As far as the 40's go, if I remember right, Cagney's White Heat was done in '49, wasn't it? Considering it was the last of the great classic gangster films, not to mention one of the greatest of those, I just wonder if it is mentioned in this episode. Looking back now, we can see that it wrapped up an era of that specific type of film, very important in film history in my opinion. I've always thought the gangster greats were given short shrift by the Academy Awards and such. Sorry for not commenting on this earlier, Rick. This was a great write-up on TCM's series, and thanks for the heads up. Maybe someone will read this and go back to add an episode dealing with foreign filmmakers' transitions to Hollywood (e.g., Fritz Lang)! This was a very interesting post, Rick. Thank you for sharing!